Today I found out the Beatles were once banned from playing in Israel until finally in 2008 a formal letter of apology was sent out to the two surviving members and certain relatives of the deceased members, including an invite for Paul and Ringo to come play at Israel’s 60th birthday bash. This may come as something of a surprise for people as the Beatles’ own manager, Brian Epstein, was Jewish. Although, of course, Before they signed with Brian, Paul McCartney’s father, Jim McCartney, displayed a bit of anti-Semitism, being skeptical of it being a good idea to put Paul and his band in the hands of a “Jewish businessman”. Also, John Lennon was known for making off-the-cuff anti-Semitic remarks, often in Brian’s presence such as the time when Brian asked the boys what he should call his forthcoming autobiography, John shot back, “How about ‘Queer Jew’?” (Brian was gay.) In fairness to John, he was not specifically anti-Semitic; most of his life, Lennon was just very “anti-everything”! The Beatles also got in some trouble thanks to a publicity gimmick in 1968. Paul went out one night and painted a promotional design for the Beatles’ new release, a record called “Hey Jude”. He painted a big “Hey Jude” promotion right in the middle of London’s business district. Several local Jewish businessmen called the Beatles’ “Apple” organization, furious at the anti-Semitic display. They remembered all too well in Europe during the Nazi’s reign the hateful “No Juden” signs. Paul, totally ignorant that “Hey Jude” would be interpreted this way, was surprised and immediately had the “Hey Jude” painting removed. Resolution 691: Resolved: Not to allow the [Beatles’] request for fear that the performances by the Beatles are liable to have a negative influence on the [country’s] youth. Resolution 709: …the band has no artistic merit… [performances] cause hysteria and mass disorder among young people. Head of the Education Ministry: There is no musical or artistic experience here but a sensual display that arouses feelings of aggression replete with sexual stimuli. While many similar sentiments were often heard by concerned parents around the globe, Israel decided to not grant the necessary permits to allow the Fab Four to play in the country, even though they had been previously booked there. In 2008, a formal letter of apology was sent to Paul McCartney, Ringo Starr and certain relatives of the deceased members of the band. 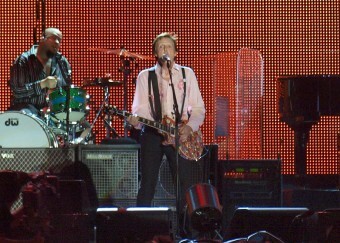 On September 26, 2008, Paul McCartney became the first Beatle or Ex-Beatle to perform a concert in Israel. Paul’s “Friendship First” concert, celebrating Israel’s 60th anniversary was, by all accounts, a smashing success, performing before a delighted crowd of 40,000+ in Tel Aviv. 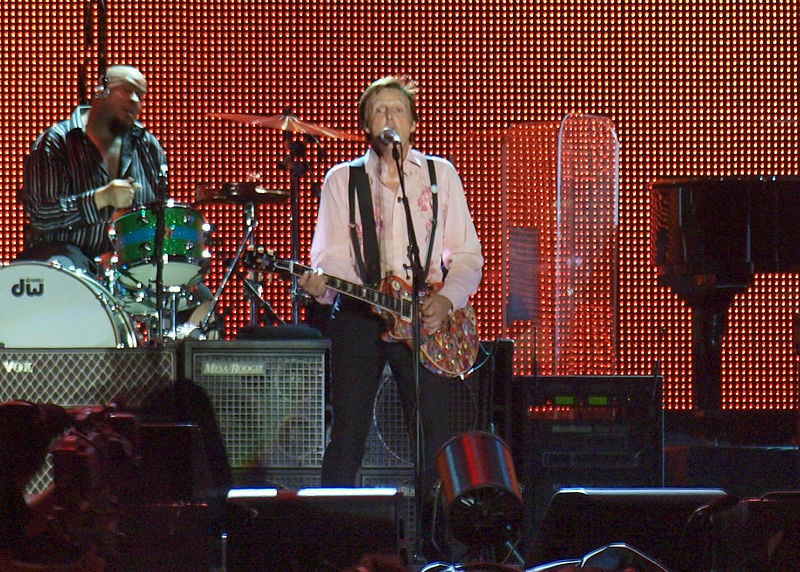 Given the banning of the Beatles in Israel almost from their inception, and the above listed concert in Tel Aviv, you might think it was Paul McCartney, but you’d be wrong. Although a majority of the 40,000 strong in Tel Aviv were Jewish, they were not an “all-Jewish crowd”. It was a teenage John Lennon in 1956 playing a gig at the Lee Park Golf Club in Gateacre, England. John’s band at the time called themselves “The Quarreymen”. It was still a few months before Paul McCartney was to officially join the band and form the actual genesis of the Beatles. Lee Park Golf Club was an upmarket “Jewish only” golf club, a fairly common institution in the 1950s. Nigel Whalley, an early member of John’s band, worked at Lee Park as an apprentice golf pro. Nigel had talked the secretary of Lee Park into booking the Quarreymen as an extra attraction at a Saturday night club dance. John and his fellow band members appeared at the concert formally dressed. The band’s musical selection for this strange concert is not known. John, as the youthful band’s eager lead singer, probably sang the latest hits of his heroes- Elvis, Chuck Berry, Buddy Holly and Little Richard. The largely adult crowd sat, politely watched and applauded. There was no set fee, but supper was provided for the happy-to-be-working teenagers and a collection was taken for John and the boys afterwards. There’s actually a back story to the story of Israel banning the Beetles. It is told that that Brian Epstein had a nephew who lived in Israel. That nephew decided to capital on his connections, and bring the beetles to Israel himself. At the time the field of concert organization was pretty much a monopoly of the biggest producer in Israel at that time, Gyora Godik. Godik came to the nephew with a proposal – stating that the two of them will bring the beetles together, and split the profits. The nephew was sure that he didn’t need the help of no one, and told Godik to sod off. Godik told him – ‘If I’m not bringing the Beetles – There will be no show’. Godink then used his influence on the education minister, Jacob Sharid, and the Israelis were denied what would have definitely an historic event for the country. Thanks for this info, I didn’t know Paul played Israel. Shame on him, given the crimes of Zionism that that have resulted in the murder of so many Palestinians…For Shame Paul! I love your website! When are you going to make an app where we can check daily interesting facts??? please do so!!! with love from Toronto. Agreed. Israel is the world’s most racist country. It makes apartheid South Africa look good by comparison. All artists should boycott the Zionist regime. Same reasons for banning them in apartheid SA (no surprise there).